When you want to send to influencers a set of products instead of a single one, you'll need to create a bundled product. In this case, you must create one single product page and describe all the products within it. If you ship through Octoly and you want to create a bundle you have to put the EAN code 1111111111116. If you're shipping with Octoly, please make sure to fill in the shipment form by indicating all the specific EAN codes for each product of the bundle. 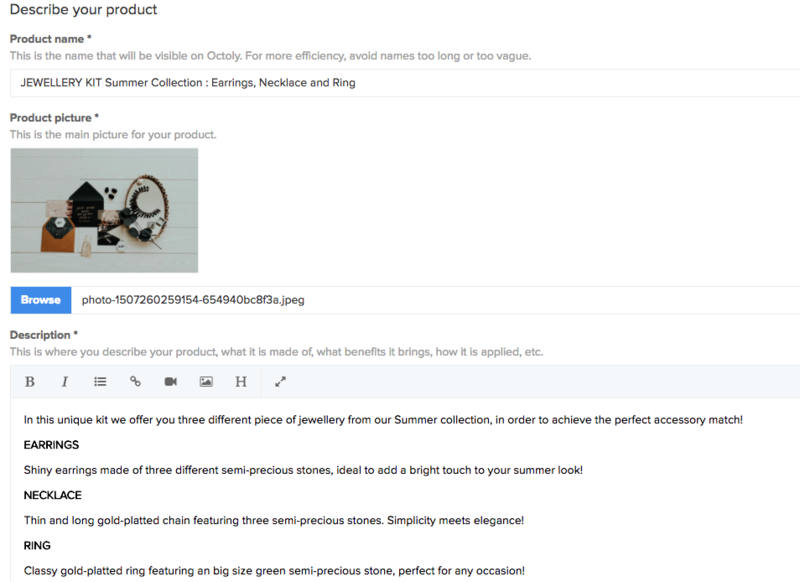 It will allow the Octoly warehouse to identify the products individually, before putting them together as a bundle. For a refresher on Octoly's shipment procedures, please read the article "What is the logistics process when shipping via Octoly?". If you are self shipping, you can put whatever EAN code you like for your bundled product.